The demons and gargoyles are coming. Aaron Eckhart will play Dr. Frankensteinâ€™s creature, Adam. Bill Nighy, Yvonne Strahovski, Mirando Otto, Socratis Otto, Jai Courtney and Kevin Grevioux are in the cast. 200 years after his shocking creation, Dr. Frankenstein’s creature, Adam, still walks the earth. But when he finds himself in the middle of a war over the fate of humanity, Adam discovers he holds the key that could destroy humankind. 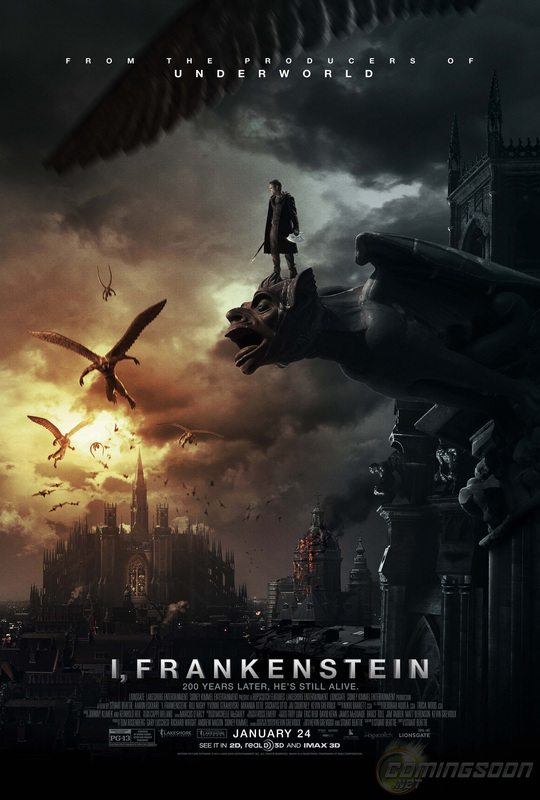 From the co-writer of the hit supernatural saga, UNDERWORLD, comes the action thriller I, FRANKENSTEIN, written for the screen and directed by Stuart Beattie, screen story by Kevin Grevioux and Stuart Beattie, based on the Darkstorm Studios graphic novel “I, Frankenstein” created by Kevin Grevioux. “I, Frankenstein” will be in theaters next year on January 24. The new poster does give a familiar â€œUnderworldâ€ vibe since itâ€™s from the same producers.